There are several genetically distinct forms of Progressive Retinal Atrophy in dogs. 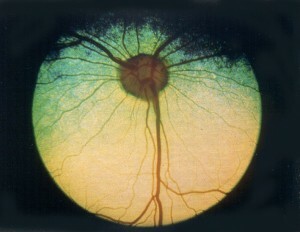 PRA is a gradual degeneration of the retinal tissue. The form found in Australian Shepherds is Progressive Rod Cone Degeneration (PRCD). Age of onset is usually in the prime of life. The first things an owner might notice is night-blindness. The disease progresses, over months or years, until the dog is blind. The disease is caused by a recessive gene mutation. Since PRCD is progressive, it may require multiple exams before diagnosis can be confirmed. PRAs can be misdiagnosed. Any Aussie diagnosed with PRA should also have the PRCD DNA test to confirm the diagnosis. Affected dogs should not be bred. Carriers should be bred only to mates that have tested clear and all offspring which will be used for breeding will need to be tested. Preference should be given to non-carrier offspring. Carriers should not be used at public stud.